The butter cookie base is very similar to the Raspberry Cream Thumbprints—it contains a bit of cream cheese to lend a subtle tartness and creaminess to its flavour. 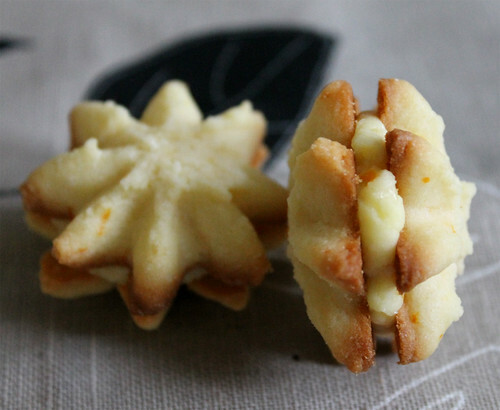 I use the star nozzle on my cookie press, but if you don’t have a cookie press, you can easily make these with a piping bag and star tip. The orange buttercream is lightly sweetened and packed with a lot of orange flavour, with the addition of both orange zest and fresh orange juice. It does go soft very quickly, as it’s a high-fat ratio to sugar, so I usually like to keep these cookies in the fridge and pull them out about a half hour before I serve them. Buttery cookie bursting with orange and vanilla flavours—what’s not to love about these irresistible (and oh-so-pretty) sandwich cookies? For an orange-chocolate version, you can dip the bottoms of each cookie in melted semisweet chocolate and let it set before sandwiching them with the buttercream, or use a chocolate-orange ganache instead of the buttercream. 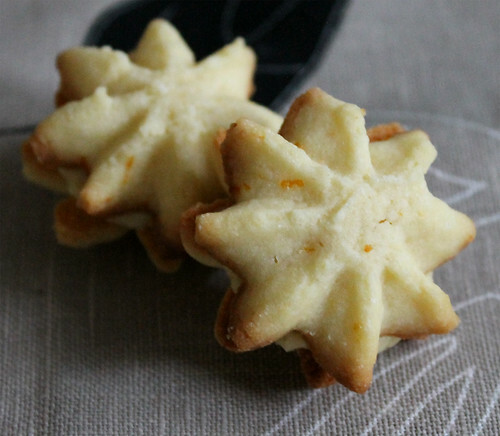 Find the recipe for Orange Creamsicle Cookies here.